So it is already August. You know what that means, Halloween, Thanksgiving, and Christmas paraphernalia will be available in stores any second now. Instead of fighting it, I’m giving in, and therefore sharing a spirit that must be enjoyed during the holiday season, but can and should be enjoyed year-round. 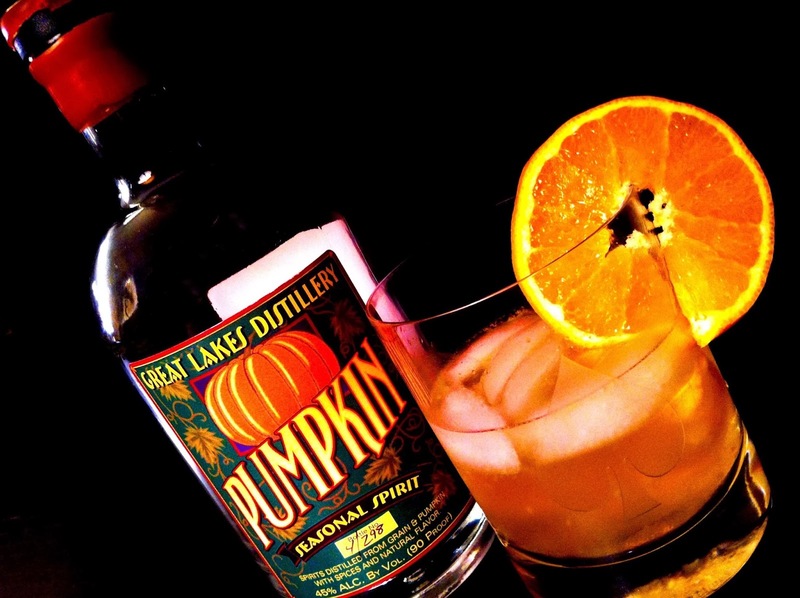 The delightful spirit of which I speak is Great Lakes Distillery Pumpkin Seasonal Spirit. My discovery of Great Lakes Distillery Pumpkin Seasonal Spirit involved traveling for work. I traveled to Edina, Minnesota for work for a quick two night trip. There was no time for sightseeing or sampling what Minnesota had to offer until the last evening, when four of us were able to take a couple hours to visit one of St. Paul’s restaurants, Heartland Restaurant & Farm Direct Market. We arrived early for our reservation and grabbed some seats at the bar to enjoy a cocktail. We had a fantastic bartender and the cocktail list had some very unusual and interesting choices. The Spiced Old Fashioned, with Great Lakes Distillery Pumpkin Spirit, Minnesota maple syrup, and bitters, caught my fancy. The bartender quickly prepared my cocktail with a scoop of ice, a pour of the spirits, a splash of the bitters, and a squeeze of maple syrup, which he explained was better mixed with a little water to thin it out, topped with a curled orange peel. When I tasted my beverage, I fell in love. I immediately had visions of my husband and me sitting in front of the fire, him cradling a tumbler of scotch or a snifter of brandy and me holding my brand new tasty cocktail. My husband loves scotch, whiskey, and brandy, and in our travels I have found some spirits that I can tolerate, but I am by no means a whiskey girl. Give me a glass of wine, a pint of beer, or a fruity cocktail any day. Bring a glass of whiskey near me and my nose immediately begins to crinkle. But this spirit is different. It starts with Lakefront Brewery’s Pumpkin Lager, which is based on a Thomas Jefferson recipe and contains a blend of spices including cinnamon, nutmeg, and cardamom, and is distilled and aged in bourbon barrels by Wisconsin’s first small batch distillery. It is a hard alcohol that I can actually drink without making a screwy face. When I came home I ordered myself a bottle of Great Lakes Distillery Pumpkin Seasonal Spirit. I also found a number of drink recipes, including one similar to the one I had at Heartland Restaurant & Farm Direct Market, on Great Lakes Distillery’s website. I also had to purchase bitters, because who has bitters lying around? I have made a few of the recipes I found online, all of which have been fantastic. In addition to the Pumpkin Maple Old Fashioned, I made the Pumpkin Spice Martini, with heavy cream, hazelnut liqueur, and maple syrup, and the Pumpkin Old Fashioned, similar to the maple version, but with a muddled sugar cube and orange slice, a dash of bitters, and a splash of seltzer. I almost feel like I should be vacuuming the house in a dress, pearls, and heels . . . almost. Great Lakes Distillery Pumpkin Seasonal Spirit can be purchased online from Binny’s Beverage Depot, Caddell & Williams, or Merwin Liquors.